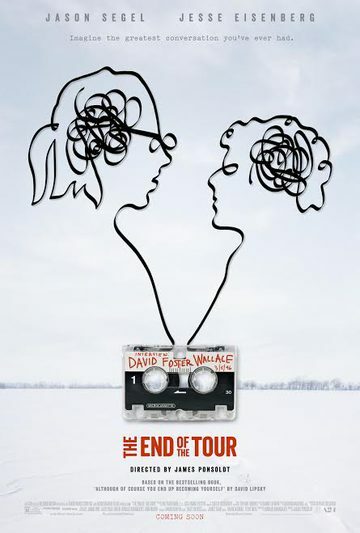 THE END OF THE TOUR tells the story of the five-day interview between Rolling Stone reporter (and novelist) David Lipsky (Jesse Eisenberg) and acclaimed novelist David Foster Wallace (Jason Segel), which took place right after the 1996 publication of Wallace's groundbreaking epic novel, Infinite Jest. As the days go on, a tenuous yet intense relationship seems to develop between journalist and subject. The two men bob and weave around each other, sharing laughs and also possibly revealing hidden frailties – but it's never clear how truthful they are being with each other. Ironically, the interview was never published, and five days of audio tapes were packed away in Lipsky's closet. The two men did not meet again. The film is based on Lipsky's critically acclaimed memoir about this unforgettable encounter, written following Wallace's 2008 suicide. Both Segel and Eisenberg reveal great depths of emotion in their performances and the film is directed with humor and tenderness by Sundance vet James Ponsoldt from Pulitzer- Prize winner Donald Margulies' insightful and heartbreaking screenplay.